Greetings Class of 2023 & Transfer Students! All new students are required to attend an orientation session. At orientation, you will learn more about our campus, register for classes, meet your classmates, get to know the resources and people who are here to help you achieve your goals, and find out the answers to your questions as you prepare for the start of the academic year. Lycoming College offers orientation sessions throughout the summer. Registration for summer orientation begins in February. After sending in your confirmation deposit, you will receive an email with a link to register for your orientation session. Then, during the week following Accepted Students Day (April 7, 2019), you will receive a letter and email from the Dean of First-Year Students office, which includes your login username, password and instructions to access WebAdvisor through the myLyco student portal. Once this information is received, you can begin the tasks that need to be completed prior to orientation. We cannot accept registrations over the telephone or by email. For all International Students. Parents are welcome. For all students who come from a great distance who are unable to attend a June session, as well as all students that come from our partnership organizations (KIPP, YES Prep, NOBLE, MOSTe, and Say Yes). Parents are welcome! 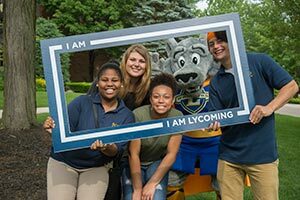 After you have completed your orientation registration, you will receive confirmation of your summer orientation dates via their @lycoming.edu email accounts (accessible through the myLyco portal, using the same login and password you received from the Dean of First-Year Students). Below you will find important information that will be useful while you are registering for orientation, as well as leading up to your arrival for your orientation session.